Let me get this out of the way up front—the Best Medicine Rep Theatre is on the second floor of Lakeforest Mall in Gaithersburg. It is the first time I have ever been to see a show in a mall, and you know what—it was good. Really good. So good that you really want to go see it before it closes. We need more laughs—and these were laughs of the best kind: ‘Play Date’ skewers pretentions, misapprehensions, and the insularity of people, but it never skewers the humans trying to find their footing and purpose. “Play Date” involves no actual children. And given the sheer insanity of the show, that’s a delicious gift for the grownups watching these terribly befuddled adults trying to “adult.” This show is genuinely funny; it’s a homage to madcap, zany, totally off-the-wall comedies (in recent years, think Ken Ludwig). “Play Date” does, however, explore some topical ideas about the perceived worth of women’s work, gender roles and the human tendency to try to force reality to fit expectations. The show concerns a last-minute playdate arranged by Missy, with the prodding of her ambitious husband Blaine. The attendees are Deb, whose husband is a senior partner in the firm Blaine works at (Blaine’s a junior partner); Carol, the divorced mom from next door who even though she has five kids is dead set on finally having a girl; Trent, the neighborhood stay-at-home-father (and has-been commercial actor); and Rowan, a British friend who is a professor. These six adults need a baby-proofed house more than the toddlers do. Playwright, and artistic director of Best Medicine Rep, John Morogiello is the man responsible for this very funny, fast-moving farce (hey, at the start of the show, he said to blame him, so I’m just doing as instructed). There are some truly hysterical moments in the show, more than enough to make up for the few places where the momentum lags or the characters seem flat. Each character gets a chance to direct a monologue directly at the audience; while this fills in a little back-story, it doesn’t really fit the farcial aspects which so winningly command the show. On the other hand, Morogiello gets some moments so breathtakingly right that you want to applaud right then. For instance, when Blaine, speaking to “perfect” Deb says he’s just watching her to get some “pointers” to teach Missy later, Deb goes completely still for an instant and then says very quietly, “She needs no pointers. She’s more like me than you think.” It’s a telling moment, and completely over Blaine’s head. Another inventive touch is using baby monitors to hear what’s going on in the rest of the house. The action mostly takes place in the kitchen; a sort of Alice-in-Wonderland room with fixtures and furniture that just aren’t quite right-sized. There are three doors that lead to the playroom, foyer/front door, and bedroom/bathroom. Using the baby monitors throws some expected, and unexpected, hilarity into the scenes. As directed by Melissa B. Robinson, you can feel the actors’ (as expressed by their characters) glee and freedom within the structure of the fast-moving play. The actors are Kira Burri (as Missy/Carol/Deb) and Evan Crump (Blaine/Trent/Rowan). They are ably assisted by Johnna Leary who plays every offstage character. Burri and Crump give tour-de-force performances as the six characters, using movement and voice, as well as minimal costume changes, to signify which character is which. Both actors show their versatility without ever overrunning their characters’ limits. Best Medicine Rep started in 2016 and is devoted entirely to the development of new comic plays. Given the quality of this production, I hope to see the theatre grow and reach many more. We need more laughs—and these were laughs of the best kind: “Play Date” skewers pretentions, misapprehensions, and the insularity of people, but it never skewers the humans trying to find their footing and purpose. Advisory: Language, alcohol use, combat. Running Time: Seventy-five minutes with no intermission. 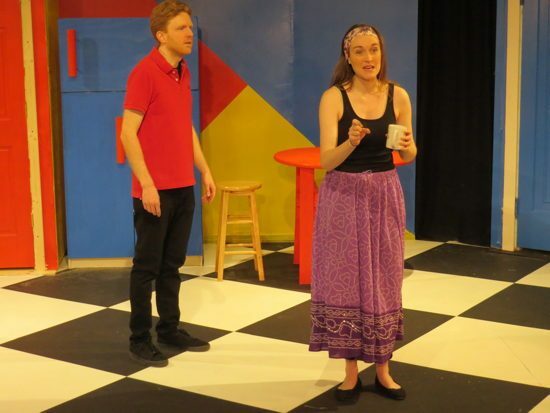 “Play Date” runs from April 4 – May 5, 2019, at Best Medicine Rep Theatre, on the second floor, Lake Forest Mall, Gaithersburg, MD. For more information, please click here.